Wednesday August 5th 1903 I did some cooking this morning. We had a hard rain Walter cleaning up the yard. The afternoon more pleasant. I was sewing on my white waist. Thursday August 6th 1903 Will churned and washed for me in the forenoon. Walter went home sick. Will went to help the neighbors thresh in the afternoon. I was down town and stopped at home a little while. weather pleasant.. Friday August 7th 1903 I ironed and did some other work. Mother and Hattie came out for the day. We had such a good visit. I got my white waist nearly done. Will went to town in afternoon. I am having trouble with my head again. I sneeze so much. 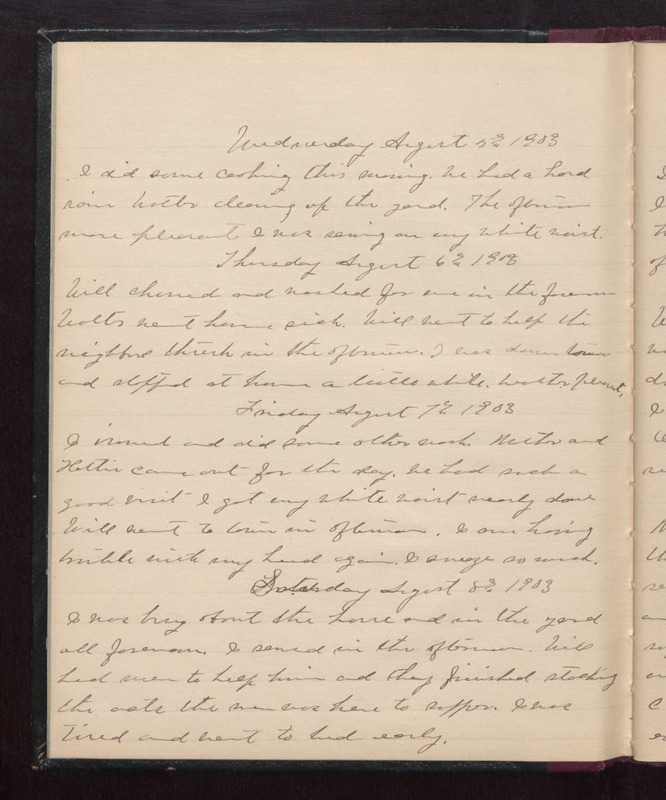 Saturday August 8th 1903 I was busy about the house and in the yard all forenoon. I sewed in the afternoon. Will had men to help him and they finished stacking the oats. the men was here to supper. I was tired and went to bed early.